Josh Bezoni says, "It’s BioTrust’s mission each year to empower more than one million individuals world-wide to improve their nutrition, reduce body fat levels, increase performance, and positively transform their health through our informative articles, inspiring community, and our all-natural line of premium, scientifically-backed nutrition products." On behalf of their loyal customers, BioTrust Co-Founders Josh Bezoni and Joel Marion have donated over $914,000 to Make-A-Wish® to date. What’s more, BioTrust was named the #1 contributor to Make-A-Wish Central & South Texas in 2013, and more recently, BioTrust was recognized with the 2014 Make-A-Wish Corporate Partnership Award. Overall, Josh and Joel have had the honor of helping fund more than 114 wishes for children with life-threatening medical conditions through their alliance with Make-A-Wish. Josh Bezoni and Joel Marion are also very passionate about eliminating childhood hunger in America. That’s why they’ve teamed up with Share Our Strength’s No Kid Hungry® program. To date, BioTrust has provided over 1.4 MILLION meals to hungry children. Listen to Josh talk more about BioTrust’s charitable mission and making a difference in the world in his recent interview on Lewis Howes’ School of Greatness Podcast. November 2013 - Josh Bezoni and Joel Marion contribute $12,384 worth of BioTrust premium, scientifically-backed supplements to Food Bank of the Rockies. December 2012 - In commemoration of the tragedy at Sandy Hook Elementary School, Joel Marion and Josh Bezoni donate 40,000 meals to needy and hungry children, women, and men during the holiday season. 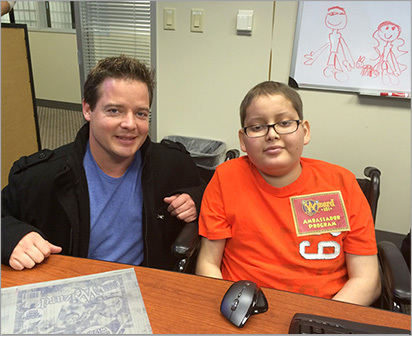 Wizard 101, and Allan got to show Josh how he plays his favorite video game. September 2013 - Joel Marion and Josh Bezoni donate $4,000 to Mikey Oliveri, who was born with Muscular Dystrophy and is desperate need of raising funds to enlist the help of the experts at the MAYO Clinic. With Joel and Josh’s help, Mikey has surpassed his fund-raising goals and will be able to get the medical attention he needs. June 2013 - Josh Bezoni and Joel Marion donate over $4,000 in supplements and logo t-shirts to the Thunder Baseball League (Broomfield, CO), a youth baseball organization founded on promoting good character and developing young players’ skills. All donations were part of the leauge’s second annual Susan G Komen baseball tournament, with proceeds going to the Susan G Komen for the Cure Foundation, the most widely known, largest, and best-funded breast cancer organization in the US. November 2013 - BioTrust Co-Founders Joel Marion and Josh Bezoni donate $3,215 to help young baby Chase Borden, who had to have brain surgery immediately after being born, and his family afford proper medical and travel expenses. September 2013 - Joel Marion and Josh Bezoni donate over $1,500 in products to Love146.org for their charity race event. Love146.org is an organization dedicated to tackling the challenge of ending worldwide child trafficking and exploitation. The donations will be shared with participants taking part in the event. May 2013 - Josh Bezoni and Joel Marion contribute $1,500 to the American Red Cross in an effort to assist the victims of the tragic Oklahoma tornadoes. December 2013 - Josh Bezoni and Joel Marion donate $1,000 to First Descents. This Denver-based organization offers young adults with cancer fighters and cancer survivors a free outdoor adventure, which is designed to empower them to climb, paddle, and surf beyond their diagnoses, defy their cancer, reclaim their lives, and connect with others doing the same. November 2013 - BioTrust Co-Founders Josh Bezoni and Joel Marion contribute $1,000 to an employee who suffers from prostate cancer. The donation will go toward alternative cancer procedure options. December 2013 - Josh Bezoni and Joel Marion sponsor ($500) one member of Team BioTrust to participate in the Peidmont Athletes for Ultimate Air Trampoline & Tumbling organization. Articles by Josh Bezoni | BioTrust Nutrition Blog | Company Info | Contact | JoshBezoni.org © 2019 Josh Bezoni, All Rights Reserved.